Aluminum refers to the type of metal that the panel is made with. Aluminum is able to be repaired using the paintless dent repair process. Unlike steel panels which kind of want to return to their original pre-dent shape, aluminum has no memory. Aluminum requires more pressure for each push and does not stay where it is pushed. Repairing dents in aluminum is considered a more advanced procedure. For this reason, there is between a 25-50% mark-up per panel. More and more vehicles are using aluminum because it is so much lighter than steel. This makes the vehicle weigh less and become more fuel-efficient. Hoods are the most common panel to be made of aluminum. Many deck lids, doors and even some roofs and fenders are made using aluminum as well. A magnet may be used to test if a panel is steel or aluminum. If the magnet sticks, it is not aluminum. Many aluminum panels are what is referred to as honeycombed. The photo below shows a honeycombed hood being prepared for paintless dent removal of hail damage. Note the limited access. Typically, if an aluminum panel is damaged past the point that a quality PDR repair can be performed, the body shop will usually order a new panel. The new panel may be OEM (Original Equipment Manufactured) or after-market (a part made elsewhere designed to fit). 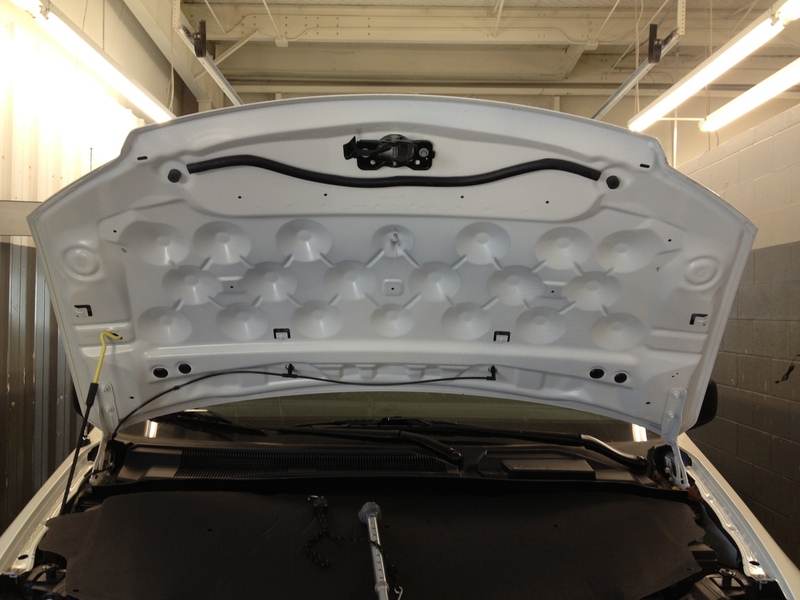 The body shop will prepare the panel for paint and re-finish the new part to match the rest of the vehicle. Most shops have the ability to repair aluminum car panel (s) if they choose, but is not cost-effective or as good of a repair as replacement. Glue pulling aluminum is a complex procedure. The aluminum moves differently than steel and the temperature of the glue cools at a different rate. Dents can be pulled from aluminum with excellent results but it is an advanced skill set. Read about the next term: A-Pillar – The post that runs down along the sides of the windshield in front of the front doors.